Fiji Times Defence lawyers, Devanesh Sharma outside High Court on May 15, 2018. Photo: Ronald Kumar. 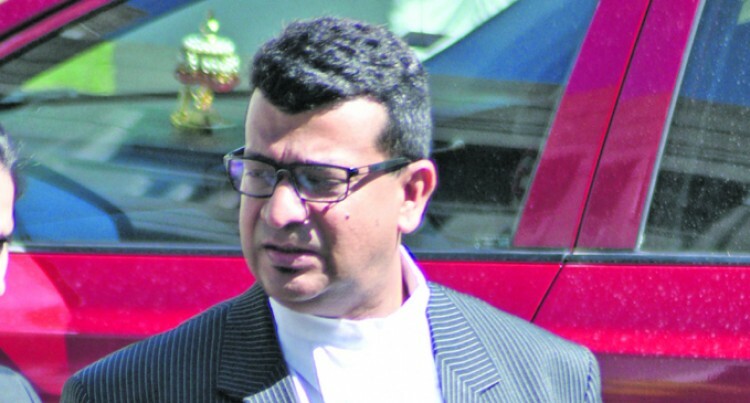 Through his lawyer Devanesh Sharma, Chand said the letter was from the Office of the Minister for Education, which contained the ministerial letterhead. Mr Sharma made submissions to the court on Monday during hear­ing for a stay application submit­ted by his client, Chand. Referring to the letter Mr Sharma said it provided the schedule of costs for Mr Bole’s heart bypass surgery at the Mercy Hospital in Auckland, New Zealand, and ad­vised Chand to liaise with the hos­pital to settle his medical bills. Mr Sharma told Justice Riyaz Hamza that there was nothing in the letter which told Chand to consider Mr Bole’s request for pay­ment of costs. He said his client acted in accord­ance with Mr Bole’s directive and authorised the settlement of all of his medical costs. It is alleged that between Novem­ber 14, 2012, and July 4, 2013, while being employed in the public ser­vice as the FNU VC he allegedly abused the authority of his office by doing an arbitrary act for the purpose of gain. This was namely by approving the payment of $213,905.05 for over­seas medical treatment for former Minister of Education and FNU chairman Filipe Bole from FNU funds without the approval of the FNU Council, which was prejudi­cial to the rights of the university and the council. Further, Mr Sharma said any “gain would be absolutely zero for my client” as alleged in the charge because every single cent was for Mr Bole’s medical expenses. He said pursuant to Section 173 (4) (d) of the 2013 Fiji Constitution if Chand acted on Mr Bole’s direc­tive than there could not be any ac­tion arising from that directive in any court of law. Mr Sharma said anything that any minister did in their term dur­ing the Interim Government can never be challenged because of the “blanket immunity” granted to them. He asked if any ministerial deci­sion could be challenged under the immunity provision. “Why was Mr Bole given complete immunity when he was the benefi­ciary?” Mr Sharma stated. He said if Mr Bole was granted immunity than no one could be charged from acting under his di­rective. Under the Constitution, immu­nity was granted from the period starting December 6, 2006, until the first sitting of Parliament on October 13, 2014. “What is good for the goose is good for the gander,” he said, add­ing that if Mr Bole is protected than his client, who had acted on the former minister’s letter, should also be exempted under the immu­nity provision. Fiji Independent Commission against Corruption lawyer Rashmi Aslam submitted that the crux of Subsection 4 of Section 173 is that no court or tribunal shall have the jurisdiction to accept, hear, deter­mine, or in any other way enter­tain, or to grant any order, relief or remedy, in any proceeding of any nature whatsoever which seeks or purports to challenge or question the validity of any decree during the immunity period. He said in order to claim immu­nity under Subsection (4) (d) the directive must be made under any decree, promulgation and subordi­nate law. Mr Aslam said the Executive Authority of Fiji Decree of 2009 did not provide any powers to the minister to make such a directive to the VC. Mr Aslam submitted that the im­munity provision was stipulated under Section 156 of the Constitu­tion and not 173, as stated by Mr Sharma. Mr Aslam said on totality of the letter sent to Chand by Mr Bole there was no directive. He said the best person to con­firm whether it was a directive or not was Mr Bole himself, who is included in FICAC’s list of trial witnesses. Mr Aslam told the court that it was premature to decide at this juncture whether the letter was a directive or not. He added the threshold for stay of proceedings had not been met and the application advanced by the de­fence must be dismissed. Justice Hamza will deliver his judgment on June 25, 2018.